Changing Thinking to Create Equity - Are We Up to the Challenge? Today's post - Day 21 of the giftEDnz October Blog Challenge - is all about equity and is inspired by the article below and the accompanying visual image which was also the subject of a Twitter Chat discussion. 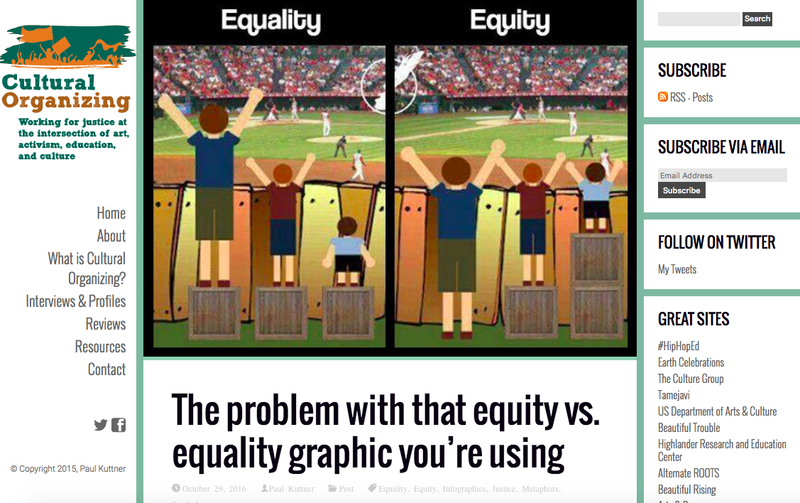 Many of us have seen this graphic above (circulating for about two years) and we've often used it in education when we're advocating for the needs of our students, in this case, our gifted students. But it's an incorrect expression of what should be happening for students who are in a minority group. 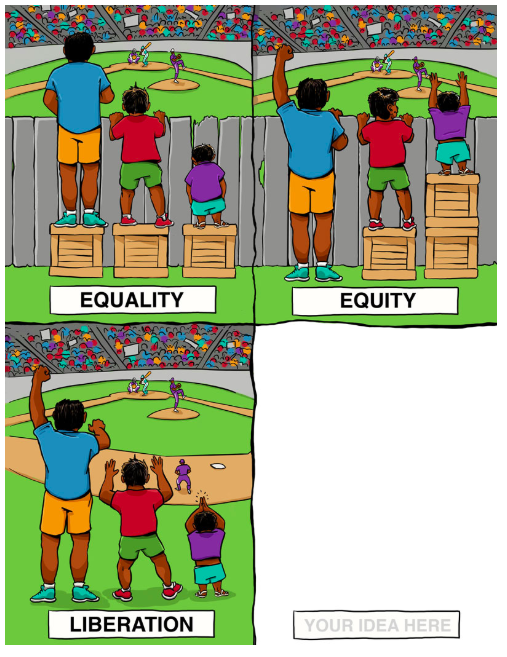 There is a distinction between equity and equality and it's a very important one if we are to meet the needs of ALL of our students. So what is the difference? Don't they both achieve the same outcome? No, they don't. The article explains it very well and I've summarised it below. Everyone has access to the same number of crates and is using them to attempt to see over the fence. The only one benefiting from the crates is the middle student. He can now see. The first student is tall enough that he doesn't need the support and the crate for the third student does not work or change their situation. In the second graphic the students all have what they need in order to be able to participate. So how does this relate to gifted education? What does it mean? In Aotearoa New Zealand, all of our students are fortunate enough to be able to access education and there are systems in place to make sure that they can participate. However, not all systems meet all individual needs and there are adaptations that need to be made and learning that needs to happen in order for it to be a truly equitable system. Gifted education is just one part of it. There are many others which will be discussed in a later post. What if we made a third change - and removed the fence (barrier) altogether? We need to stop talking about the 'achievement gap' and reframe it as an 'opportunity gap'. Seeing it as an achievement gap is deficit thinking, in my view, which is also a central view in this article. This type of thinking implies that it is the abilities of the students that are causing them to not achieve when it is a far bigger issue of opportunity. If we don't offer the same range of opportunities, then this is where issues of equity will always arise. This ('achievement gap') is a distraction that stops us from acknowledging and focusing on real issues. "As many have argued, it should actually be termed the “opportunity gap” because the problem is not in the abilities of students, but in the disparate opportunities they are afforded." teacher expectations and beliefs - and deficit thinking - which goes back to the first point of the need for effective, and sustained, professional learning and development that leads to changes in practice. One-off courses will not do this unless they have sustainability built into them. 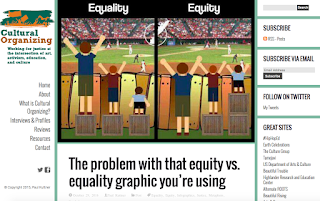 The final graphic in the article is the one below - where strategies aren't put in place to create equitable situations which may not be sustained. It is the complete removal of the barriers. I know that some of the points above could lead to these barriers being removed for ALL our gifted students. Are we up to the challenge? I believe teachers always have the best interests of their students at the heart of what they do and they are always up to the challenge of learning more. But they can't do it alone. It's time for the government to see this as a priority and help us remove the barriers for this group of students. Original generation time 2.3322 seconds. Cache Loaded in: 0.0496 seconds.